Is it a little girl’s room or a tween’s cozy retreat? The beauty of this bedroom is the way it’s inviting to such a broad age range. 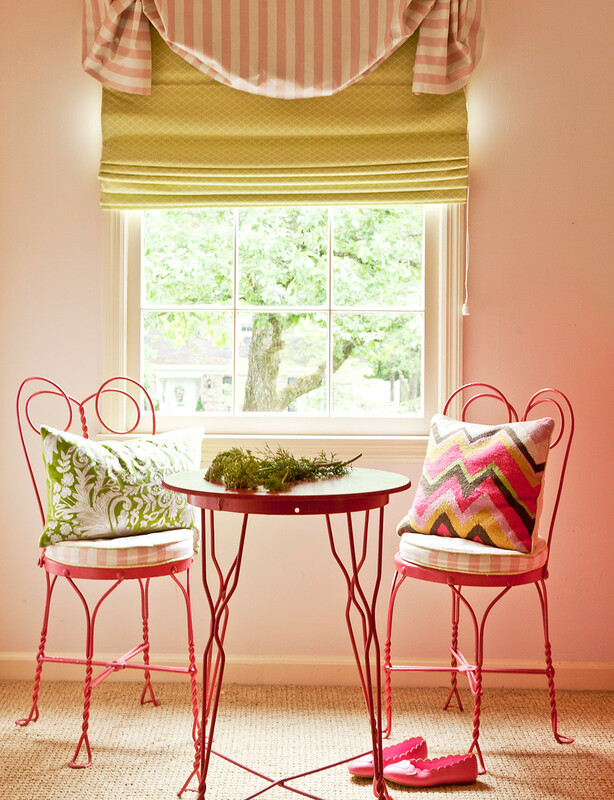 Krista Lewis allowed her daughter, Eleanor, to have a say in the design with lots of bold pink accents and a pale pink wall color. Is it a little girl’s room or a tween’s cozy retreat? The beauty of this bedroom is the way it’s inviting to such a broad age range. Designer Krista Lewis of K. Lewis Interior Design holds a special place in her heart for this space because it was her own daughter’s bedroom. She was 5 when the space was first designed but grew up in the room for several years. Lewis shared how she created a room that could easily grow with her daughter and ways to make that easy in your own kids’ spaces. How do you create a room that can “grow” with a child? For that room we did an … upholstered queen size bed that also had a trundle underneath it for flexibility. It was almost like a daybed and it was up against a wall which is important when your kids are little so they’re not falling out. But it also made it look a little bit more grown up because it looks more like a sofa. It functioned really well. Eleanor, this is her room, and her older sister and younger brother would just all pile in there and we’d read books and sometimes they’d all sleep in there. It worked really well when they were little and she still has that bed. She’s 14 now and she stills love it. How much say do you think a child should have in the design? How do you make them part of the process? I’ll show (kids) fabric books or wallpaper and say, ‘Do you like any of these patterns or colors?’ and they really do have opinions. They really want to feel like it’s their space. A lot of time they’ll want purple walls or something like that and we’ll have to say ‘We can do purple, but the purple on this little paint chip is going to be really, really purple in your room.’ So you let them pick a direction and you incorporate the things they like in ways that work in reality. [In this room] she was funny because I painted her walls a light pink and she was like ‘I can’t even tell they’re pink!’ She wanted color in there so I listened to the owner. What advice do you have about using patterns? On the big pieces you’re investing in, use the solids because you’re going to be married to those pieces longer, like the bed. Her bedspread was from Target so that’s more of a disposable thing and in our new house I did custom bedding that was monogrammed but that’s a solid color because I’m not changing that. Then the ottoman is a piece that could be more affordably re-upholstered. Why did you choose to add the table and chairs? My daughter had a little kitchen and we had it in a big closet in that room. She loved to play like she was a waitress and so that’s why we had that little bistro set in there because she loved to come take your order and go back to her kitchen and make it and bring it to you. But it’s a good little work table. It’s good to have a little table if you have room for it and by putting the bed against the wall we had more room. A bistro table allowed space for playing waitress and as Eleanor got older could be used for homework or reading.